Extremely high quality in esthetics, these plaques can either be readily hung on walls or displayed standing majestically on a table. The four celestial guardians are the basis of landscape feng shui. They are the green dragon, white tiger, black tortoise and red phoenix. It is said that every site or home is surrounded by four symbolic animal spirits. Ideally these four directions should be harmonious with each other. Their presence in harmony would encourage the dragon's breathe (lung chi) to settle and creating the most auspicious energy. An important consideration is that all sites or home should be sloping and well drained. Unfortunately, in modern homes, the surrounding landscape in cities usually cannot attain such great criteria, therefore you could invite these four celestial guardians to bring great feng shui into your homes and premises. They should be spread around the house according to their cardinal directions. When balance within the home is created, the four celestial guardians with each associated to one cardinal direction will bring you career, wealth, good health, power/authority and fame. They are also known as the protectors of four directions, thus providing safety and preventing dangers for the family. Note: These plaques are energy infused. What the Four Celestial Guardians symbolize and how to place the objects? Ideally, for excellent feng shui, the landscape of the surrounding is the most important factor to be considered before looking into the flying star system of a building. If the landscape is bad, the feng shui can never be good no matter how good the flying stars are. To cure such problems, this set of four celestial guardians are the best replacement of perfect landscape for city dwellings today. 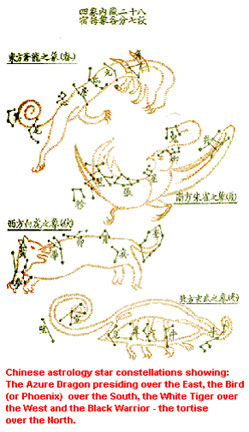 The chinese astrology studies have shown that the location of dragon is at the east, the phoenix in the south, the tiger in the west, while the tortoise is in the north as shown below. In olden days, all houses in China were built to sit north and face south. This is to avoid cold winds coming from the north to enter the main door. The back of the house should be protected by mountains or using trees as shields behind the house. They would also carefully analyze the landscape for the presence of Dragon's Breath for shapes that reveal the Yang Dragon and the Yin Tiger. They would examine the landscape where the dragon and the tiger meet. This is where sharply rising Yang Dragon merges softly with the undulating Yin tiger ground.The Dragon brings upon the essence of life, in the form of its celestial breath, known to many as sheng chi. Then the front of the house should have a wide open space and a low land to represent the phoenix. If you are hanging all of them together on one single wall, the above is the correct arrangement. Anyone learning feng shui is advised to understand the roles of these four creatures play in achieving good feng shui. Of the four, the green dragon is most prominent and significant. The dragon epitomizes the emperor, signifies heaven, and is the most celestial of all creatures. Having his image attracts good yang energy to our homes. Having his image in our homes would benefit us hugely for success in every area of our lives. He would bring us wealth, business luck and many filial children. He should be positioned in the east of the living room. The white tiger on the other hand would protect the household from any harm. His presence would especially benefit politicians and high ranking officials. He should be positioned in the west of the living room. The black tortoise is as important as the dragon, and his presence would benefit us in career, promotions, having a good job and smooth business undertakings. His position is in the north. The red phoenix on the other hand would bring us fame, recognition and public success. His position is in the south.